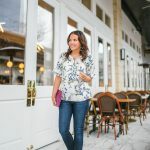 I always love when Spring fashion starts hitting the stores, and I can start adding all the beautiful colors and floral prints into my wardrobe. I feel like I am not the only one loving the Spring fashion right now. Most of the items I’ve been purchasing lately have been selling out before I have the chance to share them on the blog. It always bums me out a little to share such a cute top when you can’t shop it yourself. Keep your eyes peeled to Instagram and Instagram stories, and I will try to share when some of these tops come back in stock! I feel like this happens every March, and the items usually get restocked quickly. 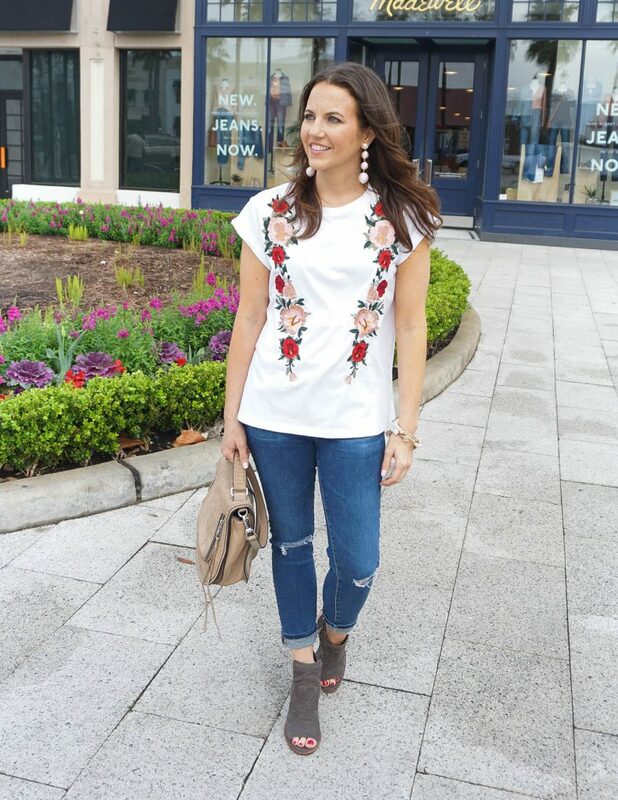 This embroidered floral top is the perfect piece for a casual Spring outfit. I love how perfectly it pairs with distressed jeans and booties. It can also be styled with shorts and sandals when the weather heats up this summer. Don’t forget to scroll down to join the Style File Link Up and thanks for taking some time out of your day to visit! 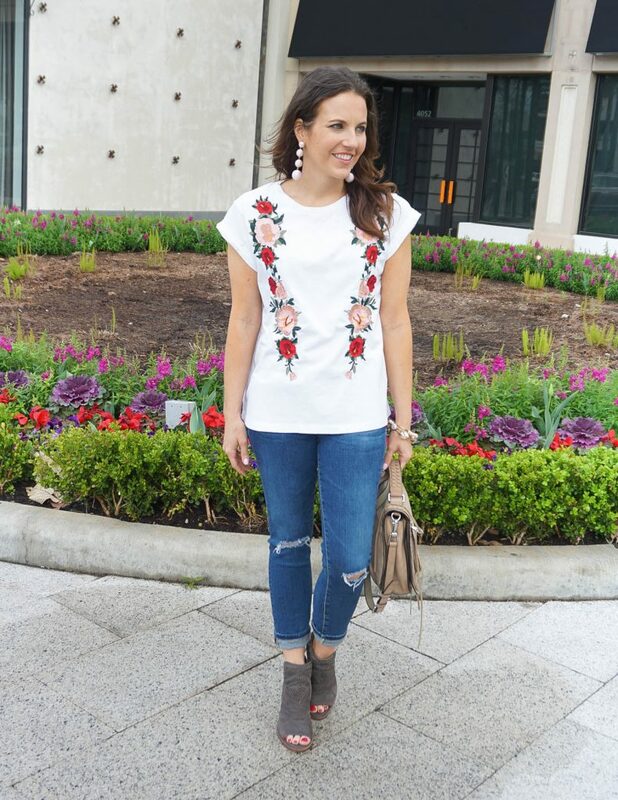 I love the floral embroiderer top, very pretty colors, the peep toe heels are such a nice pair! Karen, I LOVE this top! It’s perfect for spring! That top is so pretty. 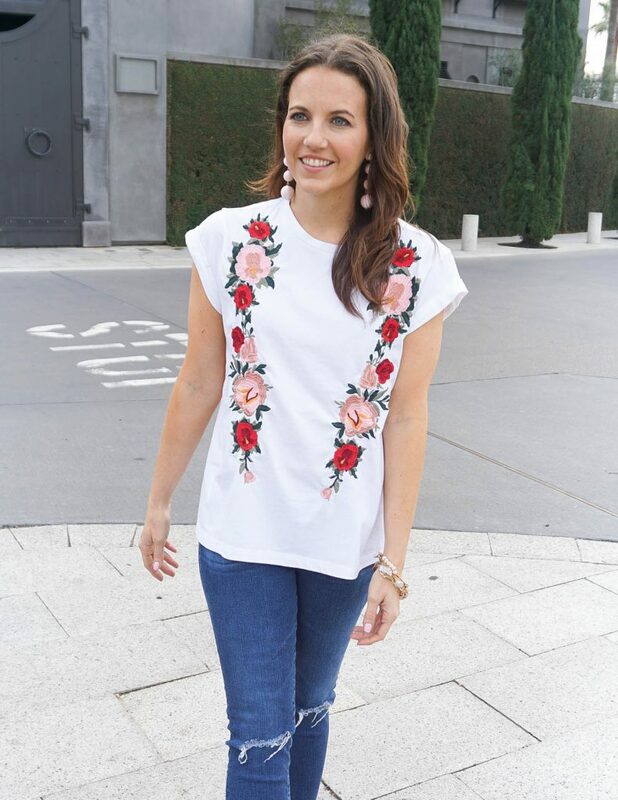 The floral adds to the whole look and would be so easy to style! Really pretty top! Beautiful Spring outfit. 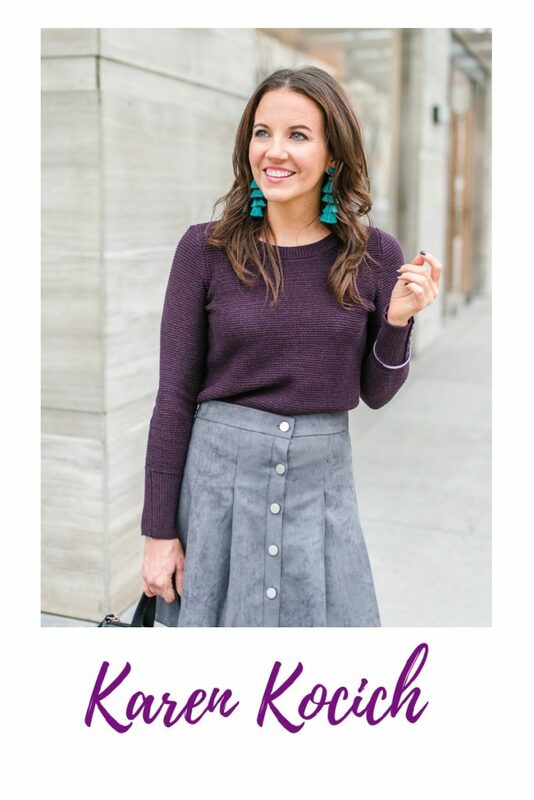 Those Bauble Bar earrings are gorgeous…I have a real earring obsession at the moment! What a cute top!! I agree, maybe its the yucky weather but everyone seems to be itching for some spring around here. 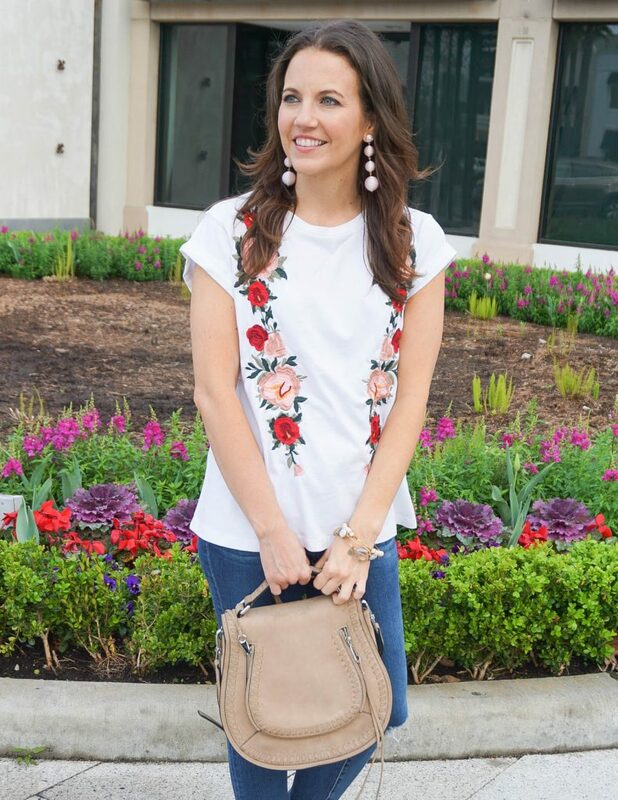 I love how white and florals just add a bright pop to any outfit and make it spring forward! 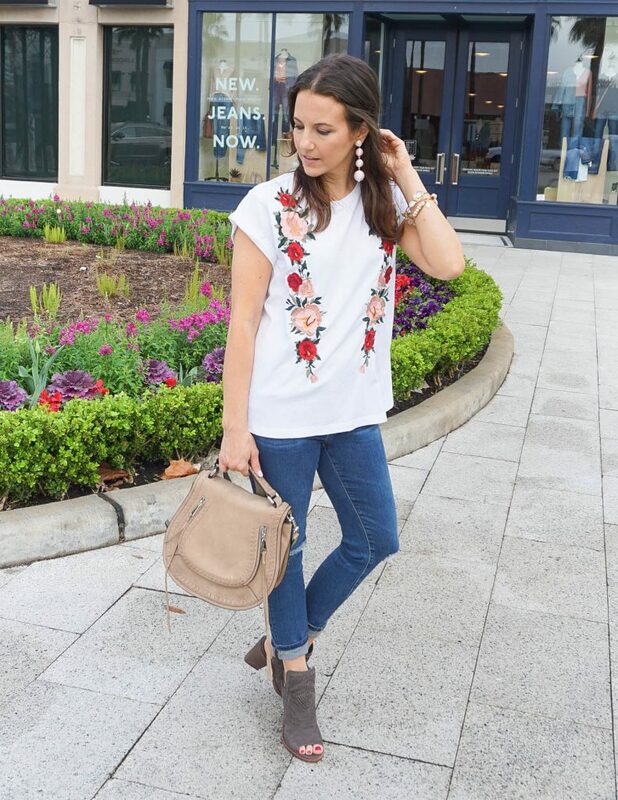 Your tee is cute, but I’m really loving your peep-toe booties! Yay for spring shoes! Love this top! It’s so effortless but chic! I really love this outfit and it looks great on you! I’m so ready to wear outfits like this everyday! I love this look! The booties and bag are amazing! That’s a cute floral top. I love that it’s on a white tee as it brightens the floral details on the front. Your peep too booties are a nice neutral color and perfect for the upcoming season. 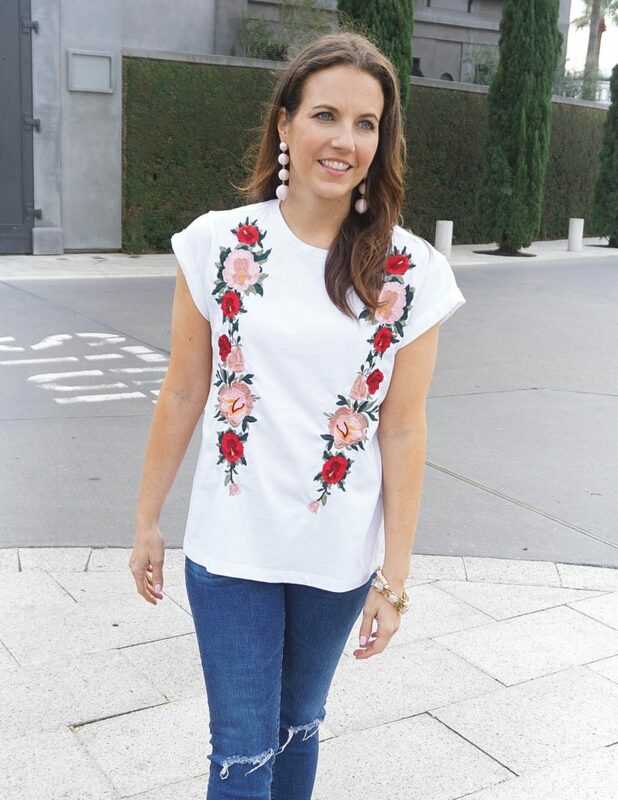 Just adore that pretty embroidered top! 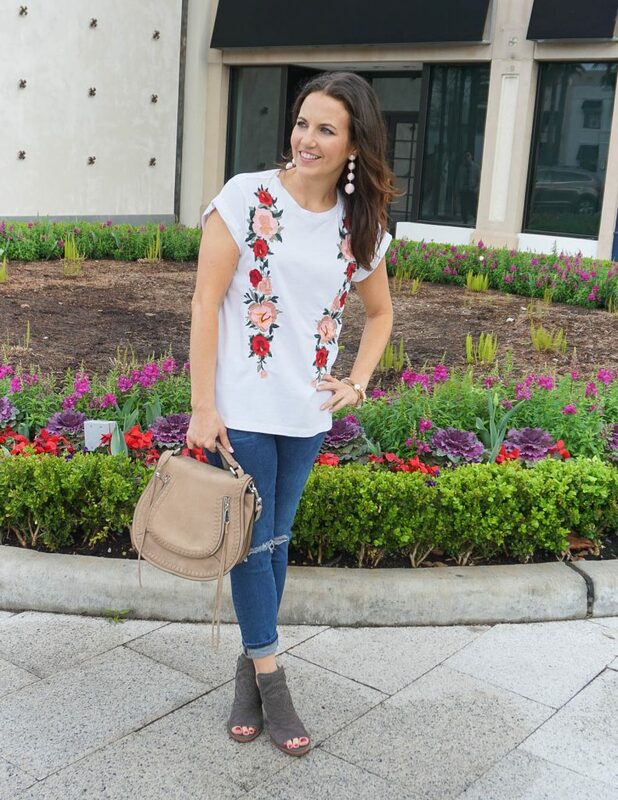 Love this top, perfect for Spring! I love embroidery so much–it adds so much pizzazz for so little effort!! I love all of those earrings you pulled together! The ones you’re wearing are the best. I have a very similar pair, but they are black. I am in love with the tee! The embroidery is beautiful and loving all the accessories. Thanks for the link up! So ready for spring after the dreary February we’ve had! This outfit is making me itch for spring, too bad we got a huge dump of snow two days ago. 🙂 Love the light colors, the floral detail, peep-toe booties, it all looks so fresh and exciting.